The thumbnail images to the left may either be viewed individually or in slide show format and show the various amenities of the Pan Am Shuttle. 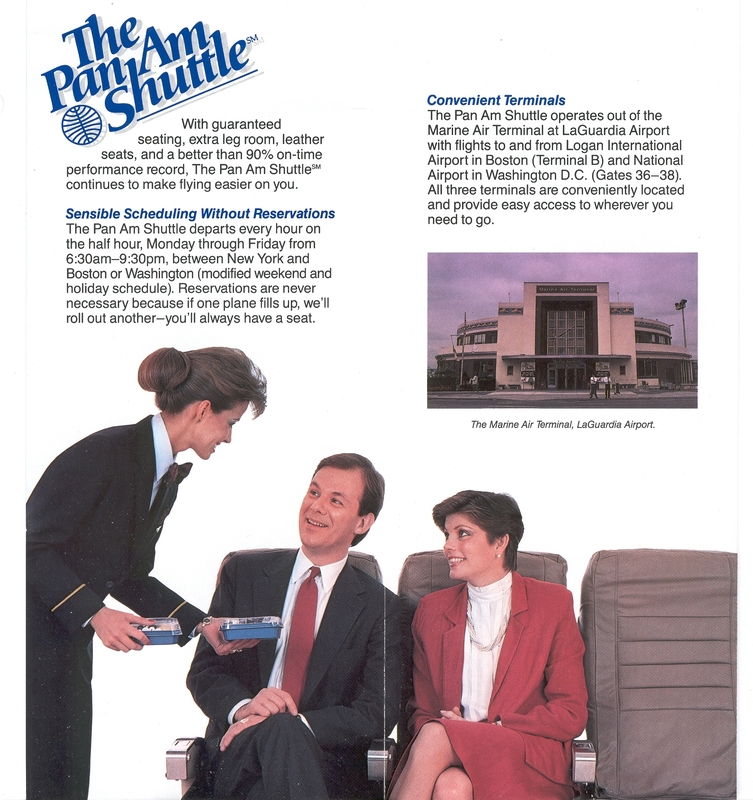 In October of 1986 Pan Am launched the Pan Am Shuttle to compete with the Eastern Airlines Shuttle, the originator of “no reservation needed” shuttle service between Boston - New York - Washington DC. 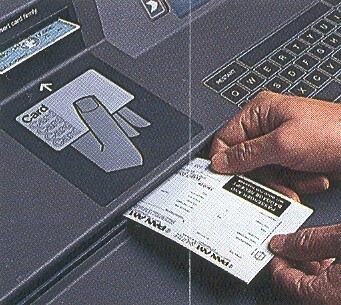 The opportunity to acquire slots at New York, LaGuardia Airport came about when Frank Lorenzo acquired both Eastern Airlines and New York Airways both of whom operated competing services in the shuttle market. 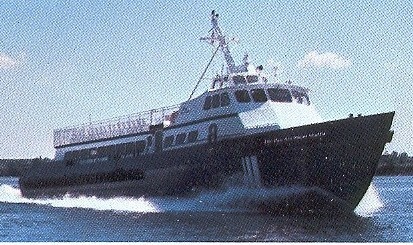 In order for the Lorenzo acquisition to gain government approval the combined airline had to divest one of the two shuttles. Pan Am attempted to move market share away from Eastern by adding two new amenities in the shuttle market. The Eastern Shuttle sold all tickets on board and offered no meals or beverages. 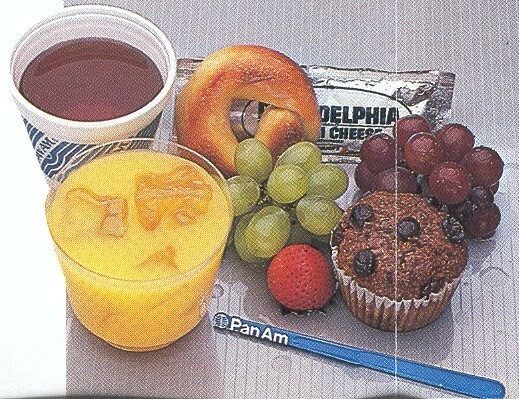 The Pan Am Shuttle offered quick airport ticketing reducing the stress of on board ticketing and allowing customers to enjoy light snacks and beverages, including complimentary beer & wine. In another attempt to garner market share from the competition Pan Am moved back to the Marine Air Terminal at New York’s LaGuardia to avoid the traffic congestion and crowds found at LaGuardia’s Main Terminal. The Marine Air Terminal was also closer to the Grand Central Parkway with separate on / off ramps allowing quicker access to the terminal or Manhattan. The design and location of the Marine Air Terminal allowed quicker access to taxiways and runways reducing ground delays. 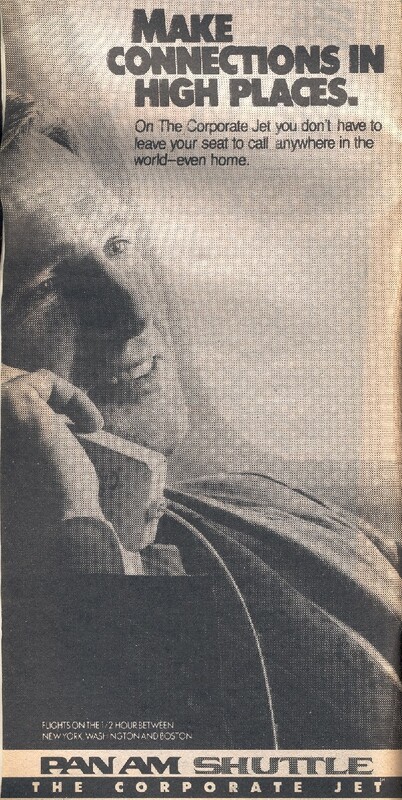 Located several hundred feet from Bowery Bay the Marine Air Terminal allowed the Pan Am Shuttle to offer a Water Shuttle to several Manhattan locations saving customers significant time during rush hours. Due to the slot allotment at LaGuardia Pan Am was able to offer the last flights of the day though a smaller DeHavilland Dash 7 was used to Washington DC to meet noise abatement restrictions at Reagan National Airport. The Pan Am Shuttle quickly gained market share with the comfort and amenities offered It was an instant money maker for Pan Am. With a 90% on time performance in all 3 markets. The Shuttle boosted Pan Am's overall on-time performance and caused a significant reduction in lost luggage statistics. 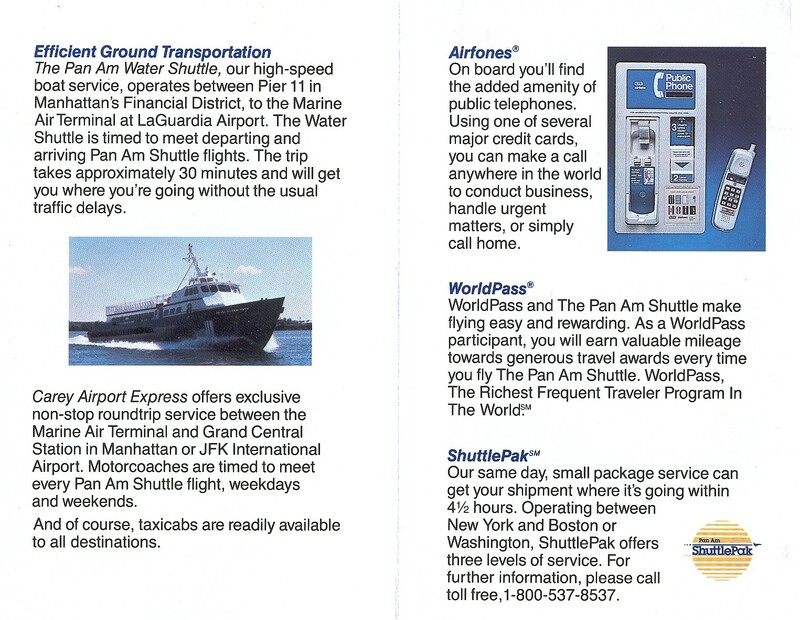 Below are some excerpts from promotional material issued by Pan Am to promote the Pan Am Shuttle. Similar to the Eastern Shuttle Pan Am had standby aircraft available for sold out flights. These additional flights were known as “extra sections and predominantly operated at peak travel times (early morning / evening and holiday weekends). Strict noise abatement requirements at Boston, Logan Airport necessitated the use of “Stage 3” Airbus A-300B4 aircraft for the first several months until 727-200s with hush kitted engines were acquired for the service. The 727-200 fleet was configured with 163 economy class seats in a 6 abreast configuration.